As part of a $300-million brand enhancement initiative, Holland America Line are planning exciting enhancements. 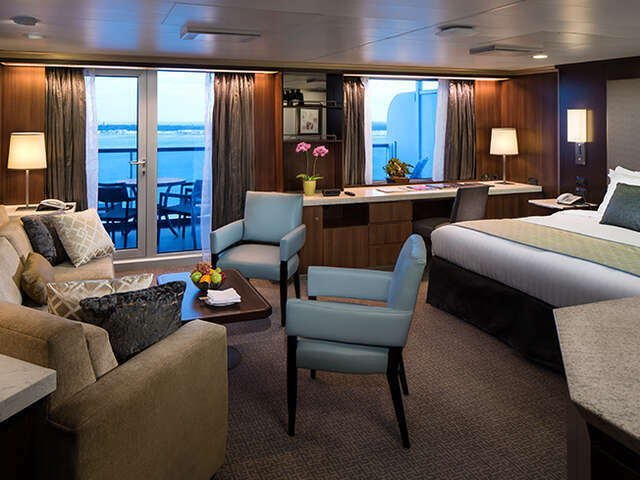 As part of a $300-million brand enhancement initiative, Holland America Line are planning exciting enhancements with new furnishings, decor, amenities and upgrades for all suites on their Signature, Vista and R-class ships. Ships will receive the suite enhancements as they head into their scheduled dry docks over the next few years, starting January 2016. New Furniture and Furnishings: Suites will be refreshed with new contemporary furniture, carpet and wall coverings along with new textiles and fabrics. New Electronic Upgrades: Including a USB outlet added to the bed’s headboard, bedside LED lights and upgraded electrical outlets. A new interactive television system for complimentary movies on demand and easy access to the daily program and shipboard information including restaurant overviews, spa services and guest billing. New Bathrooms: A wall of designer glass tile serves as a backdrop to the new vanity area that includes stone tops, modern faucets and under-mount sinks. Other enhancements include mirrors with integrated side-by-side LED lighting, floor tiles and nightlights. With a sophisticated colour palette and modern functional details, accommodations onboard Holland America Line ships have been designed with guest feedback at front of mind to reflect what guests love. Experience the renovations for yourself on one of Holland America's 2016/2017 Sailings!